Jack Abramoff, the lobbyist who spawned a congressional corruption scandal, pleaded guilty Tuesday to three felonies and pledged to cooperate in a criminal probe edging closer to former House Majority Leader Tom DeLay. "I plead guilty, your honor," Abramoff said in flat, unemotional tones, accepting a plea bargain that said he had provided lavish trips, golf outings, meals and more to public officials "in exchange for a series of official acts." 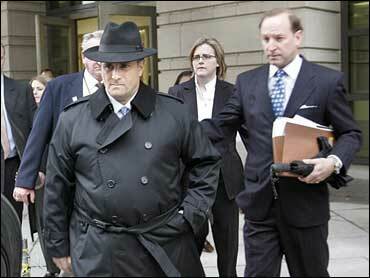 and months of negotiation with Abramoff's lawyers, reports CBS News correspondent Gloria Borger. In one case, he reported payments totaling $50,000 to the wife of a congressional aide to help block legislation for a client. The aide worked for DeLay, according to officials who spoke on condition of anonymity. Public corruption aside, Abramoff admitted defrauding four Indian tribes and other clients, taking millions in kickbacks from a one-time business partner, misusing a charity he had established and failing to pay income taxes on millions of ill-gotten gains. He is expected to plead guilty to additional charges on Wednesday in Florida in connection with charges stemming from the 2000 purchase of a fleet of gambling boats. Borger adds that 12-15 members of Congress could face further scrutiny as a result of Abramoff's plea deal. At the Justice Department, officials said they intend to make use of the trove of e-mails and other material in Abramoff's possession as part of a probe that is believed to be focusing on as many as 20 members of Congress and aides. "This investigation continues ... however long it takes, wherever it leads," said Alice Fisher, assistant attorney general. Whatever the legal ramifications, there was swift political fallout at the dawn of an election year in which minority Democrats intend to make ethics a campaign issue. "We are coming up on a very important congressional election," says Thomas DeLuca, a political science professor at Fordham University. "These corruption scandals which tend, right now, to be in the Republican party seem to be building up at precisely the time that President Bush's credibility on a host of issues has been falling rapidly." In a turnabout, House Speaker Dennis Hastert, R-Ill., joined the roster of politicians announcing plans to donate Abramoff's campaign contributions to charity. House Democratic Leader Nancy Pelosi said Abramoff's confession in court was "not a surprise because this Republican Congress is the most corrupt in history and the American people are paying the price." Abramoff faces as much as 11 years in federal prison as well as fines in connection with his guilty pleas on charges of conspiracy, mail fraud and tax evasion. The precise penalty is to be determined in part by the extent of his cooperation with prosecutors. Together with his former business partner, Michael Scanlon, he is expected to face restitution costs of $25 million. Abramoff also will be required to pay $1.7 million for unpaid taxes, officials said. Scanlon pleaded guilty last November to corruption charges as part of the investigation that began 21 months ago. The Bush administration's former chief procurement official, David H. Safavian, was charged last fall with making false statements and obstructing investigations into a 2002 golf outing. He has pleaded innocent. On behalf of clients eager to stop internet gambling and postal rate legislation, Abramoff paid $50,000 in 10 equal monthly payments beginning in June 2000 to the wife of a congressional aide identified as Staffer A. Based on other information made public, Staffer A was Tony Rudy, at the time a top aide to DeLay. His identity was confirmed by officials who spoke only on condition of anonymity, noting that the court papers did not name the aide. Austin, Texas District Attorney Ronnie Earle, the prosecutor in a money laundering case against DeLay, issued subpoenas Tuesday in connection with Abramoff. DeLay is fighting state campaign finance charges in Texas, hoping to clear himself in time to reclaim his leadership post in Congress. Earle is seeking records from Abramoff's former employers, legal firms Greenberg Traurig LLP and Preston Gates Ellis & Rouvelas Meeds, LLP. Earle has also subpoenaed records from lawyers or representatives for two Indian tribes. Abramoff contradicted statements by Rep. Bob Ney, saying the Ohio Republican accepted a golfing trip to Scotland in 2002 with the knowledge that the lobbyist's Indian clients were paying for it. Ney is not mentioned by name, but his identity is clear from a description of his committee chairmanship. Ney issued a statement saying, "At the time I dealt with Jack Abramoff, I obviously did not know, and had no way of knowing, the self-serving and fraudulent nature" of his activities. Abramoff also said he had made a $10,000 donation to the National Republican Campaign Committee at Ney's request, part of what the plea agreement refers to as the "corruption of public officials." Court documents said Abramoff solicited $50,000 from a wireless telephone company and got Ney's agreement to push the company's application to install a wireless telephone infrastructure in the House of Representatives, a job Ney's committee would have overseen. CBS News legal analyst Andrew Cohen says Abramoff "is going to be like a tour guide, leading federal prosecutors by the hand through the sordid details of these deals. The best the members of Congress can hope for is more political embarrassment. The worst is serious prison time." At the Justice Department, Fisher said that in one instance, "Abramoff was so bold as to take fees to assist one client when he was actually working for another client to defeat the first client's interests." Those clients were Indian tribes were from Texas and Louisiana, and the issue involved casino gambling. Apart from his lobbying in Congress, Abramoff raised at least $100,000 for President Bush's 2004 re-election effort, earning the honorary title "pioneer" from the campaign. White House spokesman Scott McClellan said he could not say whether Abramoff ever met Mr. Bush. McClellan said of Abramoff: "What he is reportedly acknowledging doing is unacceptable and outrageous." "If laws were broken, he must be held to account for what he did," McClellan said. Once a well-connected lobbyist able to command almost unimaginable fees -- a Louisiana tribe once paid Scanlon and him more than $30 million over 26 months -- Abramoff apologized after pleading guilty. "Words will not ever be able to express my sorrow and my profound regret for all my actions and mistakes," he said. "I hope I can merit forgiveness from the Almighty and those I've wronged or caused to suffer."